From Lancs Combination, Cheshire County League, Northern Premier League, Fourth Division, Third Division, Championship, Premier Greed League, FA Cup winners and with a bit of luck group stages of Europe. Still proud of our non league heritage. This story would be a Hollywood blockbuster in the U.S. 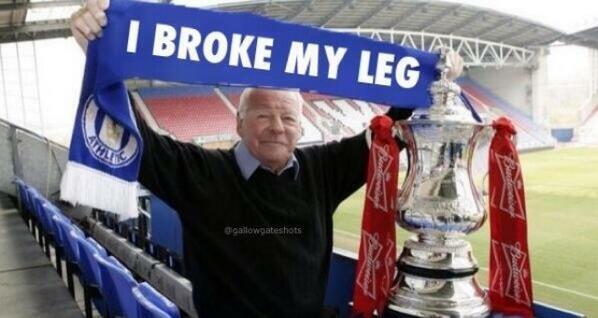 If it was a Hollywood film who do you reckon would play Dave Whelan? He broke his leg once. Hey up its Wednesday down at New Springfield tomorrow night. Well it's Friday but Wednesday are with us. A home win for The Super Tics. From an Owls perspective, that was probably the most undeserved 3 points we've got all season. Well a pretty comfortable win for the Super Tics. Looks like Wednesday have a hell of a lot of work to do. Doesn't the beer taste good when you win?